Please note all competition times are approximate and subject to change based on number of competitors and other factors. We will attempt to keep as close to schedule as possible, your help in following directions is greatly appreciated to keep the events moving. 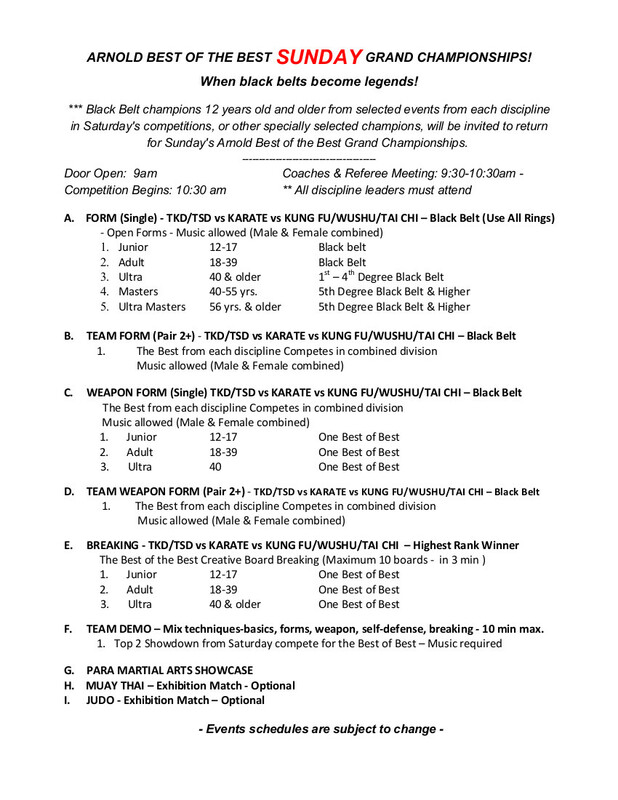 8:00am 11:00am Registration & Check-In, Weigh-In Saturday, March 2nd - Ohio Expo Center, Lausche Building. 9:00am 10:00am Mandatory Coach/Referee Orientation All coaches and referees must attend. 12:00 PM 1:00 PM Opening Ceremony All competitors, referees, and officials line up on main competition floor. Discipline leaders, masters, and VIP guests to stage.